This is my Row by Row Round Robin quilt finally finished. It was started about 5 years ago or so. I had all the rows in July of 2005 and got them together soon after. I sandwiched it and machine quilted the border with a small stipple and the strips between the rows with a wavy line and got the binding on and then started on the hand quilting. 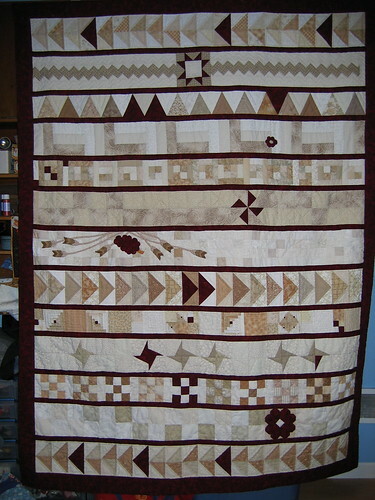 Each row has a little different quilting except the three flying geese rows. If you want to see a bit more quilting detail you can go to my flickr page along with the other quilts from the round robin. There were 13 in the group ranging in age from about 11 to around 70(?). All the quilts that have been finished have turned out so well. I have started working on a t-shirt quilt for a friend's son's graduation. First step, cutting all the t-shirts and getting interfacing fused on to stabilize the knit. Outstanding! I like the idea of rows, and I think that I ought to try that.